She Who Must Be Obeyed picked up some boneless skinless chicken thighs and the command was given that I was cooking them. I was busy so I needed to do something quick. I made Quick Jerk Chicken Thighs. I pulsed until it formed a paste, scraping the sides down several times. 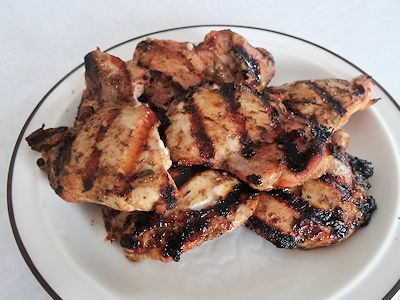 I rubbed the paste over six boneless skinless chicken thighs and put them in the fridge for 2 hours turning occasionally. I preheated my gas grill to medium high and cooked the chicken for about 5 minutes a side. I made sure the internal temperature was over 165 F and let them rest a few minutes before serving. I really like chicken with the skin on. I think it gives more flavour and a well cooked chicken skin is delicious. However, She Who Must Be Obeyed is trying to keep us healthy and a lot of the fat is in the skin. So, we get boneless skinless thighs. This recipe adds tons of flavour so it makes up for the lost skin. It has a sweet and sour balance with great herb overtones. It has a bit of heat without being really hot. I do love jerk chicken. Put all ingredients except the chicken in a blender. Process until it is a paste, scraping the sides often. Rub the paste over the chicken. Put the chicken in the fridge for 2 hours. Preheat your grill to medium high and cook the chicken for 5 minutes a side. Make sure the internal temperature is over 165 F.
Let rest for a few minutes and serve. Thanks, Ted. I hope you like it. Oh wow! I’ve been looking for a good recipe for Jerk Chicken and I think I just found it. Thanks! Thanks so much! This is a quick version that I like. You might also want to look at using the paste on chicken parts with bone and skin and grilling it like the islanders!